Port of Kaohsiung is a key link in the transportation chain that moves freight containers between Asia, Europe, and North America. By cargo volume, it is Taiwan's no. 1 international container port. Furthermore, it ranks as the fifteenth busiest container port in the world, handling more than 10 million TEUs (Twenty-feet Equivalent Unit) each year. Today, Port of Kaohsiung serves more than 300 routes, and its maritime network reaches five continents. Shipping companies have highly praised Port of Kaohsiung's excellent location, professional workforce, efficiency, and reasonable costs. The port has played a central role in the development of Kaohsiung as a thriving metropolis. Mr. Huang Yi-min, station chief at Port of Kaohsiung's public terminal area, explains how the harbor emerged as an international container port. Back in 1863, the Cing Empire – which ruled Taiwan from 1684 until 1895, when the island came under Japanese control – established the Kaohsiung Customs Office to facilitate international trade at the harbor. Foreign entrepreneurs were eager to do business, so several countries assigned consuls or leased land near the port. At the end of the same year, Kaohsiung Customs Office opened a branch office in Cijin in Kaohsiung City. In 1908, the Japanese colonial authorities initiated a Port of Kaohsiung construction project which proceeded for the next 38 years. Furthermore, in 1924, the Japanese authorities launched regular shipping routes between Kaohsiung and Yokohama in Japan, and to Guangdong in southern China and Tianjin in northern China. After the port had been renovated and expanded, the amount of international trade it handled reached 3.2 million tons per year. During World War II, Port of Kaohsiung was devastated by air raids. In 1945, the government commissioned Kaohsiung Harbor Bureau to restore the port. In 1958, Kaohsiung Harbor Bureau initiated a 12-year construction project, which including reclaiming land. That same year, Sea-Land Service Inc., a pioneer of containerization, sent the first-ever container ship, the Ideal-X, to load and unload at Port of Kaohsiung. Mr. Huang points out that standardized containers have made maritime commerce more efficient, and that refrigerated cargo containers are also available. To handle a surge in cargo throughput, the government built the New Chungtao Commercial Harbor Area, also known as Container Terminal No. 1, between 1963 and 1975. Later, container terminals nos. 2 to 6 were added. At present, Port of Kaohsiung handles 62% of Taiwan's import and export cargo volume, as well as 70% of the country's container volume. Bulk cargo loading for commodities such as iron ore, pig iron, crude oil, and coal-based materials continues. The port has zones which specialize in servicing the energy, heavy industry, shipbuilding, petrochemicals, and yacht-building industries, and makes it possible for container ships to berth near key industrial sites including those belonging to China Steel Corporation, CSBC Corporation, and CPC Corporation, Taiwan. These industries form a comprehensive maritime industry cluster. To reduce its environmental impact, Port of Kaohsiung has several initiatives, including highly-efficient bulk cargo loading facilities, brownfield rehabilitation, the preservation of wild bird habitats at Nansing Project, and bolstering local biodiversity. Port of Kaohsiung received European EcoPorts certification in 2014. Furthermore, because Kaohsiung is a delivery point for the London Metal Exchange (LME), LME warehouse members have sought non-ferrous metal storage facilities in Kaohsiung. Container ships are getting larger and larger. 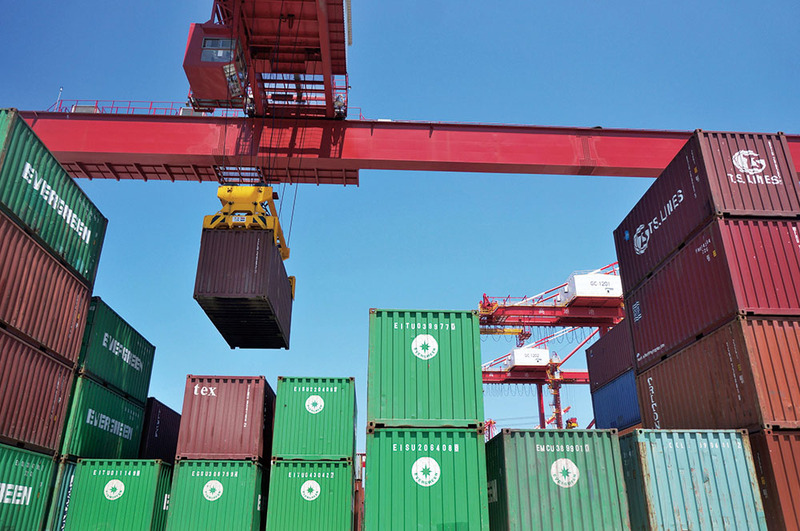 To ensure the harbor's competitiveness long into the future, Port of Kaohsiung has implemented the Intercontinental Container Center Project. The first phase of the project saw the completion of four environmentally-friendly container terminals, with a total length of 1,500m and a depth of 16.5m. The second phase of the project includes petrochemical oil storage, a new container base, and the bulk cargo stevedoring zone. Moving petrochemical storage tanks and terminals to this area will allow the petrochemical industries to achieve centralized operations. As for the new container base, it will be able to berth large container ships up to 22,000 TEU. This new base is to be completed by 2022, and it will reinforce Port of Kaohsiung's position as an indispensable container hub in the Asia Pacific.